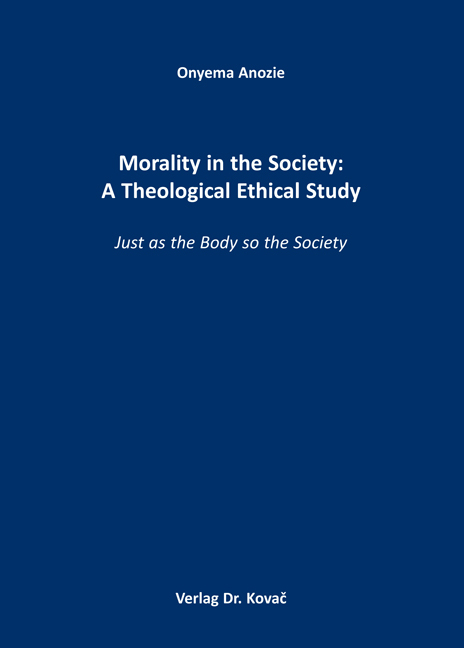 Morality in the Society: A Theological Ethical Study. Forschungsarbeit von Onyema Anozie, Verlag Dr. Kovač 2011, 218 S.
Morality in the society demands that what belongs to all should receive the attention of all concerned. The societal morality is about harmony, which springs from respectful-honest dialogue. It is about being considerate in the use of scarce resources in the community such that each person has a just and honest representation. It is being prudent through a meticulous use of the common resources. It is in general a common consciousness about what concerns all. In its practical terms it is the avowal to contribute one’s quota for the smooth functioning of the community machinery. It is all about goodness of heart and good will supported by actual devotion for the success of all that ennoble the human person. In the daily life it is about order in the society. However, morality in the society is not following the crowd, but taking the right decision at the right time in view of the well being of the other. It is taking decision for the good of the other, in honesty and integrity. It is acting always such that the other may be fully human. It also demands that members of the society overcome the limitations and barriers imposed on them by sectional hatred, arrogant nationalism, ethnicism or clannish thinking, cultural dictatorship and religious fanaticism. It is a call that all persons strive to overcome the distrust and aggression to respect, and uphold concord, in a climate, which allows the sincere and objective consideration of context that advocates a prudent search for honest remedies. The society needs the expression of genuine love, authentic justice and Christian reconciliation, born from the appreciation of the value and worth of the human person/being. It calls for a readiness to strive for what is just and right solely for the well being of the other regardless of religious affiliation or nationality.